Besides scuba diving, we offer unique and personalized excursions to the Islands of Saona and Catalina. All our dives are guided. Our dives also are relaxed, fun and entertaining. We keep our groups small to offer a more personalized and relaxed experience. When organizing the diving buddies we match divers with the same type of license similar experience and numbers of dives. We depart for the local dive sites at 8:30 am. from Bayahibe and we are back around 1:00 pm. The duration of the scuba trips depends on the dive sites. Duration of dives is 45-60 minutes, depending on your air consumption. The afternoon dive leaves around 1:30 pm. We can schedule up to 4 dives per day. Our web-site is designed for direct online bookings. Availability is limited! Be sure to guaranty your reservation by booking online NOW. We advise booking early to obtain the cheapest prices. If you have any questions please call us by using our reservation numbers: +1829 574 9655 or +1829 213 5823. Our lines and staff are here 24/7 and we look forward to assist you. If you, for any reason, ended up in Punta Cana, remember that the drive from Punta Cana to Bayahibe now is only 40 minutes, since the opening of highway Coral. It is a safe and modern road. For this reason you have different option if you want to dive with us in Bayahibe. The transfer from Punta Cana is offered against an additional fee of $120. This is a round trip and it is the same fee or groups of up to eight people. You can also rent a car, either you can pre-book it from home like at any other vacation destination in the world, or you can rent there inside the Punta Cana Resorts. The cost is from 35 USD per day plus, depending on the vehicle of course. There is no better place to do this then with us in Dominican Republic. We are proud to say that here in Bayahibe we offer the most beautiful reefs and the most spectacular walls in the whole Caribbean. Another reason the Dominican Republic is famous is the amazing cave diving available here. Be aware that technical diving is a technical sport and must be done with professional support. 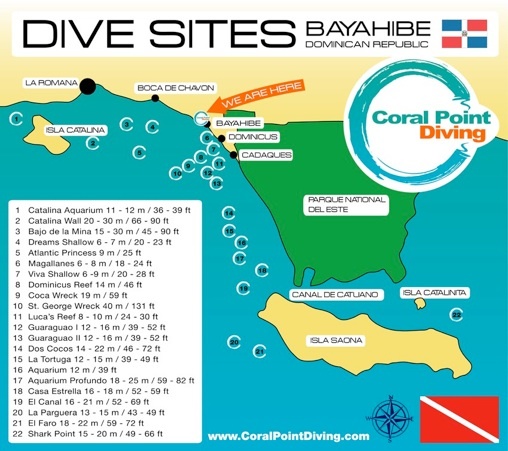 Coral Point Diving 's team in bayahibe can help you to explore Dominican Republic famous caves. Coral Point has specialized in personal/private scuba diving, which means that you as a client are central in all what we do. After many years of experience in the diving industry, we recognise that there is a need for a more personalized approach within a dive resort. This is why Coral Point Diving customizes scuba diving courses and daily certified dive trips to meet the needs of our important customers. The visit to our Coral Regrowth Project in Bayahibe is the highlight of all our Private Scuba Diving Packages.